Mordian 7th Regiment: Heresy Era Imperial Fists - Veterans and Contemptor "off the factory floor"
Heresy Era Imperial Fists - Veterans and Contemptor "off the factory floor"
As of this morning I'm officially on vacation for four days. Glorious! That said, I got a jump on the weekend yesterday evening and got the Vets and Contemptor up to the "Off the factory floor" stage where they await the first spray sealant pass in preparation for waterslides and weathering. It's always amazing to me how much of a difference painting the bases helps the models pop! Pretty happy with how the cooler tones of the bases contrast against the rather 'hot' tones of the yellows and reds. All the black got another highlight pass, and I added in the various spot colors and metallics that really help snap the models into focus. Going to be applying further details to the right shoulder pads, though whether that's to be transfers or freehand remains to be seen - While I'm pretty confident using transfers in general, the complex curve of the marine shoulder pad still gives me trouble! 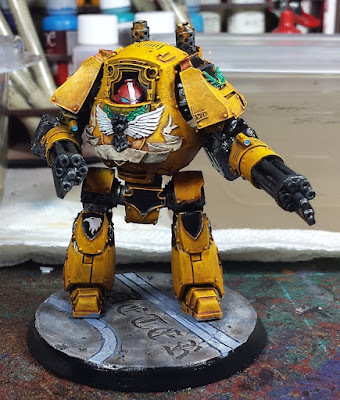 The Contemptor Mortis got the same treatment, and I'm rather looking forward to adding some chips and scratches to him - they should stand out nicely against the yellow! It's supposed to be pushing 60°F this afternoon so I'm hoping to get them sealed so I can finish off the next steps! In the interim it's back to building - The final pieces arrived for the hammer-and-shield Cataphractii terminators, and I have those and the bits to make a 10-man Templar Brethren squad soaking this morning. Should be a weekend full of Heresy Goodness! While they would look great all weathered and scuffed, surely the imperial fists sat out most of the heresy on Terra? These look great Mordian, nice with the black fists too ;) Yeah, they'd look good on the Termies. So 4 days off. . . . . You should have a demi company finished off by then (with transports)! Hope new year is just as productive for you. Fantastic work as always mate, I love it! The basing and the little flashes of red and green really do set these guys off! Awesome job mate. @Siph_Horridus: THanks man! Going to pull them out to black in the terminator fists this weekend! @Riot Ville: Haha! Here's hoping! Happy new year to you as well! @RED SCORPS: Thanks very much, my man! @Joe B: I appreciate it! Was able to get 'em sealed and a mess of new models primed in the narrow window between sub-zero temps! 60°F yesterday, snow and -1°F on Monday. Oof! I think paint chips will knock these over the top. Maybe a little streaking grime as well. Indeed - They will definitely benefit from getting roughed up a bit! You're right about the basing - makes them pop nicely!